A striking new addition to the Icelandic and European cultural scene is Harpa, the Reykjavík Concert Hall and Conference Centre and recipient of the prestigious Mies Van der Rohe award for architecture. Harpa, which has won a significant amount of admiration and attention the world over, unites Iceland’s most important classical music and performance groups, such as the Icelandic Symphony Orchestra and The Icelandic Opera, under one roof and is fast becoming a favourite place to host international conferences. With its numerous outstanding concert halls it also offers a diversity of performance possibilities, ranging from classical to contemporary, and has the privilege of showcasing both local and international performers. 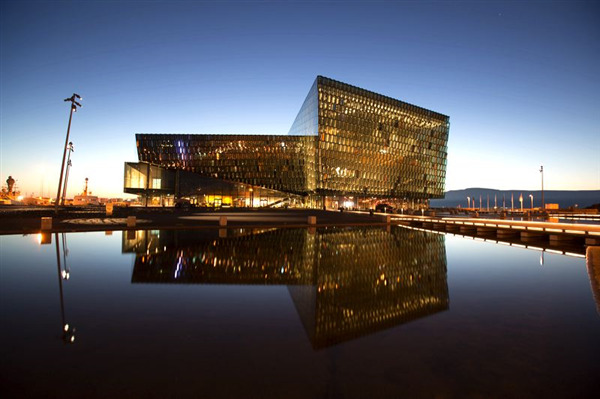 Harpa’s glass façade is designed by renowned artist Olafur Eliasson, in cooperation with Henning Larsen Architects. The design is based on a geometric principle, realized in two and three dimensions. Reminiscent of the crystallised basalt columns commonly found in Iceland, the southern facades capture the light to create kaleidoscopic reflections of the city and the surrounding landscape. The hall was opened in May 2010. Located in Harpa are two quality restaurants: Munnharpan - a lively bistro on the 1st level where you can enjoy coffee and snacks, pre-concert drinks or French and Danish inspired cuisine, and Kolabrautin - the Icelandic a-la-carte restaurant and bar on the 4th level that combines fine dining with stunning views. On the 1st level are two exclusive shops: 12 Tónar, the music specialists offering a great selection of Icelandic music, and Epal, featuring quality Nordic design and gift items.